Currently we are experiencing employment crises all over the world. With increasing robotisation (and I’m not talking Robbie Robot but ATMs, self checkout, self-driving cars, etc) this crisis will worsen. People are wailing that not enough jobs are available. In point of fact many jobs need doing. We have been bamboozled into thinking that only those jobs that are paid by large companies are “real” jobs. Volunteering is not considered real work, arts aren’t considered a “real job”, people staying home to care for children, elderly parents or disabled family members are not seen as contributing to our society. Yet, this invisible work holds our society together, makes our lives liveable, and protects the weak and the endangered. Work is not simply those things that have a dollar sign next to them. Right now we need more people working than ever—people doing the jobs that are not under the thumb of large non-democratic businesses. We need people planting trees. We need people building the infrastructure for more sustainable energy. We need cities to be made more liveable and with less impact on the environment. We need homes for everyone: efficient homes. We need people protecting our wilderness. We need people coming up with solutions to Global Climate Change. We need people who will change farming practises, so that we have less polluting run-off. We need people producing creative works that help us bond with one another, feel concern for one another, and thereby learn how to cooperate. The list goes on and on. One answer is to give people an Unconditional Basic Income. People are then freer to volunteer as a profession. They are freer to innovate and set up businesses that address what needs doing in the world. People are also freer to leave jobs that are abusive and oppressive. I personally believe all businesses should be at least half worker owned to ensure a healthy and democratic workplace. A basic income would at the bare minimum give people the right to vote with their feet. Another answer, which I believe should be in combination with a basic income, is for our nations to set up modern Work Projects Administrations. The government has the means to initiate large projects for the greater well-being of the populace who they serve. This cannot possibly be work for the dole; it must be full paid jobs with all the same workplace rights as any other job that people freely choose. It must in essence be an extension of the public service and public works. 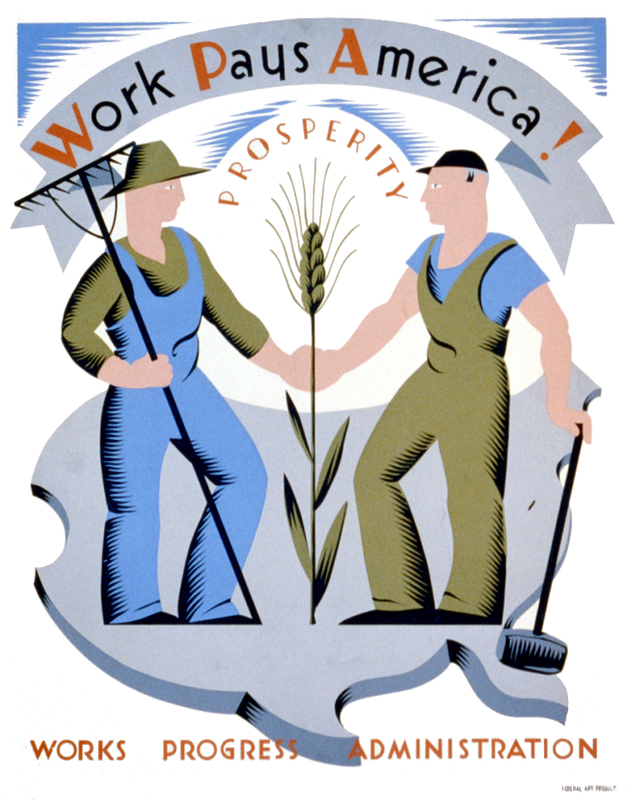 In the eight short years that the WPA was in place it had a tremendous impact on US citizens lives. In that time the country saw the rise of many new and important buildings including housing, the construction of utility plants, the recovery of the dustbowl, etc. US culture flourished in long-ranging ways that under current governments we aren’t seeing any more. It ended the depression. The answers to our current woes are right in front of our faces. We just have to find the will to make them happen.